As I've said a few times already, I'm a terrible cook. But since I began, a few months ago, to cook more often and experiment more recipes, I'm starting to get better. I obviously still have a long road to go, but I'm having more fun in the kitchen and far better results (most of the time). I think I have Pinterest and food blogs to thank for that- seeing all these pretty, tasty looking photos on a daily basis makes me want to go from pin to plate. The pavlovas above from Sunday Supper, found via Carolina (one of my very favorite pinners), make no exception. 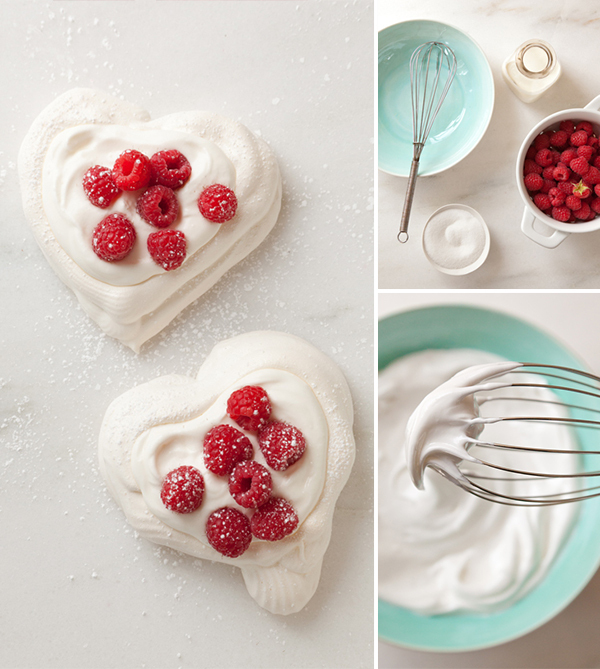 Pavlovas may not be the healthiest desserts (...), but Valentine's day is only once a year, right? - A rainbow of temporary hair chalk! - 19 houseplants that clean the air. - These shoes, oh, these shoes! - Pattern up your shorts. - 10 homemade natural beauty and spa treatments found right in your kitchen. - Share some love with the birds (via). - 20 Valentine DIY projects + printables (you can also check out my roundup from last year for even more projects and printables). - How to make your own hand-blocked stamps for printing on fabric. -drewls- i love pavlovas. haven't had them since i moved away from australia. i miss them a looooot. these look amazing. thanks for sharing. ps: zucchini chips? O_O that sounds... interesting. I can personally vouch for the zucchini chips. They taste great! I think those shoes go perfectly with that quote print. Magical, indeed. hello!,I really like your writing very so much! share we keep up a correspondence extra about your post on AOL? I require an expert in this house to solve my problem. Maybe that is you! Having a look ahead to peer you. It's an amazing piece of writing for all the web visitors; they will take advantage from it I am sure. i know yes yes i yes we all visited this part of the word last year - stunning scenery and colours, and amazing bird life. The valley of Bezirgan, above Kalkan, is a real treasure to be explored and refinance home bad credit. As the writer says, the trekking is superb -but it wrecked my aging knees! i know yes yes i yes we all visited this part of the word last year - stunning scenery and colours, and amazing bird life. The valley of Bezirgan, above Kalkan, is a real treasure to be explored and refinancing your home with bad credit. As the writer says, the trekking is superb -but it wrecked my aging knees! Thanks for sharing such outstanding information whit us, it’s very useful for me & for other I hope you will share some more info Please keep sharing!